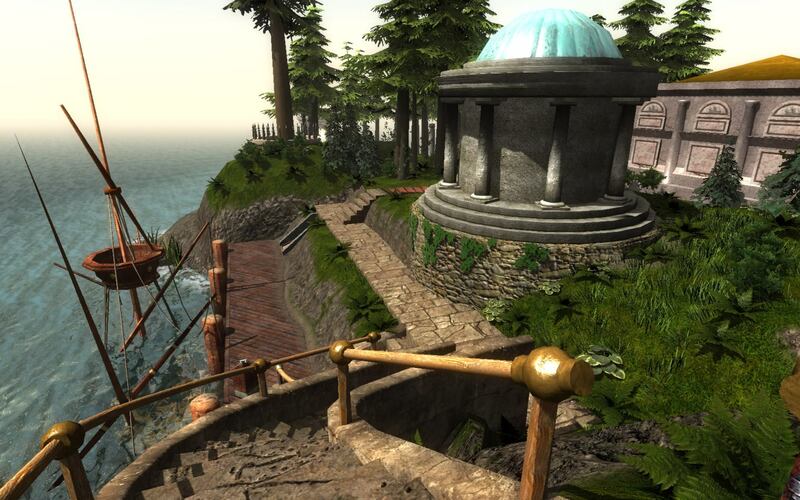 Twenty years ago yesterday, Myst showed up on store shelves for the first time. Not a bad start to an era. Myst-related news has been thin recently, but Cyan took the anniversary opportunity to announce that they're working on a new update of the classic game: RealMyst Masterpiece Edition. Their news post includes three preview screenshots. Finally, I'll note that the Starry Expanse people gave a nice demo at Mysterium in August. This is the fan "RealRiven" project that's been in progress for several years now. They released a tech demo last year, showing one of Riven's islands. They now say they have all of the islands in progress, although at early stages yet. A long video of their talk is up on youtube; jump to 08:30 to see some juice. And finally... did I already do "finally"? This'll be "one more Myst-related thing", then. My Seltani project continues to move along. I've added three small Ages in the past month: Caelios, Fleuven, and the Endless Cave. All three rely on the same sort of procedural text-generation that I've been using in IF for years. (In fact, the Endless Cave is a direct port of the "maze" area from Hunter in Darkness.) If you're curious how these tricks are accomplished, look at the Ways of Printing documentation page on the Seltani wiki, and then the Endless Cave source code. In case anybody cares (and they probably don't, but what the hell, I gathered the screenshots) -- here's a comparison between the various versions of Myst. As you can see, the three RealMyst versions use almost the same models. (The side island has been extended a little in the last shot, and there's a bit of bonus grass.) The textures and lighting are quite different. Then there's the seawater in the last shot, which has gotten a uniform "WTF" reaction from everybody I've chatted with. I'm not sure what it would look like in motion -- the animated sky reflection must be good for something -- but I really miss the reflected islands; those are what make the iOS shot so nice. Well, we'll see what they settle on. And as long as I'm tacking on footnotes, here's a Kickstarter for a (tabletop) RPG in the Myst setting. FATE Core ruleset. Sanctioned by Cyan but not a Cyan project. This appeared on one of Cyan's web sites, briefly and apparently accidentally. The web domain http://obduction.net/ (currently parked) is owned by Cyan, which pretty well confirms it. I found all these footnotes interesting, so thanks! ust to nitpick, the images in Myst Masterpiece Edition are not higher res than those in the original Myst, unless one wants to claim a higher colour resolution. The original Myst used 8-bit images for its pictures, so each pixel in an image had to be one of 256 colours. Fortunately, those 256 colours are not carved in stone; the programmer can choose any 256 out of the "millions of colors" available on a 24/32-bit display. But switching between these "palettes" is difficult without getting those flashes of rainbow noise. And if you used only a single 256-colour palette for all the images in Myst, the results would have been much less wonderful. The compromise Cyan chose is to use a common palette for every image in each Age. This is one of the reasons that the screen fades to black when moving between Ages -- to allow the color palette to be changed for the new Age without getting rainbow flashes. So for Myst, they rendered the images in 24-bit colour, then they converted the pictures to 8-bit (indexed) colour using the palette chosen for that Age. For Myst Masterpiece, they just went back to those 24-bit pictures. I don't think they re-rendered any of the pictures. I think Mattel should have tried to create higher resolution pictures for Myst Masterpiece. Myst had taken a lot of criticism by then for its "postage stamp" images. Personally, I find the notion of automatically generating double-sized images from the original 24-bit pictures to be very enticing, but I think there are complications, some related to specific aspects of the Myst images, and, of course, trying to create an automatically scaled image that had a high enough quality to be accepted by people as a Myst image.
" the images in Myst Masterpiece Edition are not higher res than those in the original Myst, unless one wants to claim a higher colour resolution." Are you sure about this? The original Myst used 544x333 graphics everywhere. (I just checked this with Riveal.) I was under the impression that MME either re-rendered or upscaled everything to 640x400. Yep, 544x333. I just used Riveal to dump the pictures from the 10th Anniversary Edition of Myst Masterpiece, and they are all 544x333. I just installed it on an XP machine -- after several unsuccessful attempts installing it under 64-bit Vista -- and that's the runtime picture size, as well. It did, however, force my computer into a lower screen resolution to make the picture seem bigger. Riveal is a cool little tool. I've known about it since its first version. I think I even downloaded it a couple of times, but I never actually used it until today. And a piece of trivia about that size: there weren't any elements required for game play in the first 16 pixels on either side of each screen. That's because Cyan wanted the game to be playable on a Macintosh LC, and the low-end 12" Color Monitor (I think that might have been its name, very creative) that was typically sold with the LC was only 512 pixels across.